Oh my. Sparks are about to fly. Happy first Friday of 2013! Hope you have a great weekend. Stay tuned for Monday’s strip…I promise it won’t have any swearing. Larry…that dog. How does he do it? 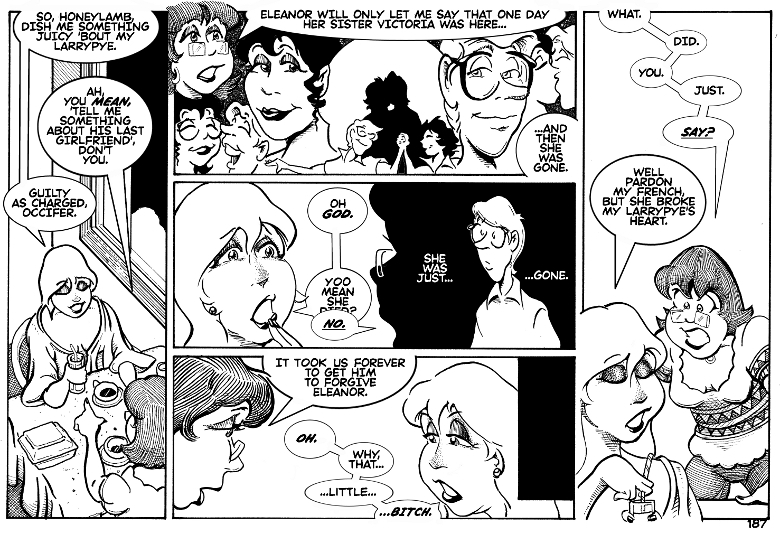 You’ll get an illustration of Larry’s superpowers regarding women on Monday. It involves-well, you’ll see. And have you noticed how much detail Charlie has added to all of the recent depictions of Larry’s eyes? Really great work. Edison would prefer that you not use Rosemary. She would prefer that you forget the word entirely. Unless you’re cooking, or singing a Simon & Garfunkel song. And Anya will be getting a comeuppance this very week. Promise. And thank you for that compliment on Larry’s eyes! I’m still experimenting, trying to get everything right. You’d think, after 188 comics, that I’d have it all down, but I’m a slow learner. So…by the sounds of it Eleanor just took her away? Though from the looks of it Anya knows more but is forced into secrecy and not allowed to tell Larry any more than there needs to be, which is stupid but whatever. Everyone is forced into secrecy on the whole Victoria thing. Eleanor, Larry, and Toivo know what happened. Toivo mentions it here. Anya knows something happened, but not much. If she told Edison what she knew, sooner or later it would get back to Eleanor. Wednesday, you’ll get an idea of what Eleanor is like when she’s displeased. Ah, it’s been a bit since I’ve read that part. Thanks for clearing that up Charlie! :3 But now I can see that under Larry, despite that he has forgiven Eleanor, still holds some anger.